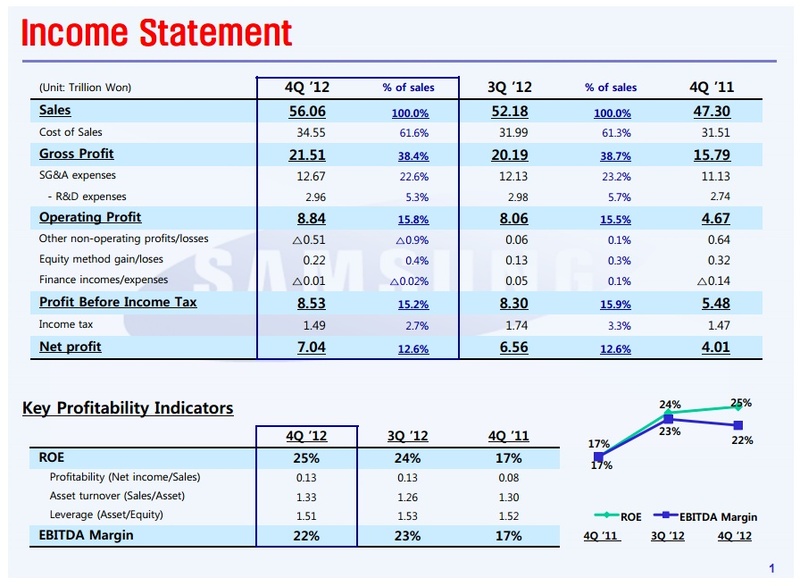 Samsung released its Q4 2012 financials last night and as expected, was another massive quarter. They took in revenues of roughly $52.45 billion and a profit of approximately $8.27 billion. Yep, that’s a lot of money. This numbers mark a 7-percent and 10-percent quarter-by-quarter increase, respectively. Also as expected, Samsung pointed out that this stellar quarter happened because of their mobile communications side and the Galaxy S3 and Galaxy Note 2 that were released this year and pushed mightily during the holiday quarter. 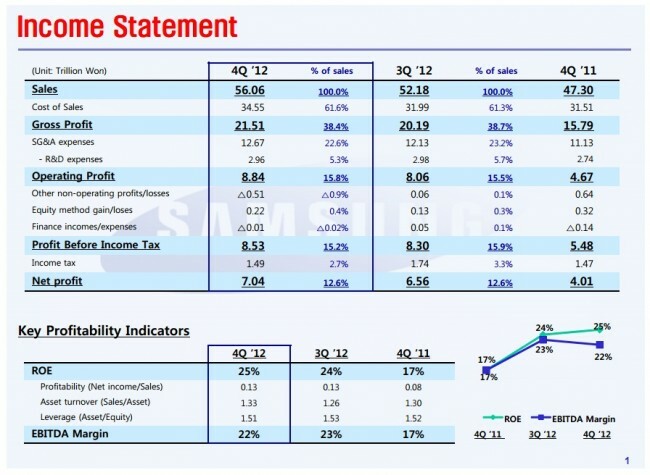 Samsung’s LED TV and semi-conductor businesses were also up, while their panel business saw a slight decline. Full press release is below. Here is the presentation. SEOUL, Korea – January 25, 2013 – Samsung Electronics Co., Ltd. today announced revenues of 56.06 trillion Korean won on a consolidated basis for the fourth quarter ended December 31, 2012, a 7-percent increase quarter-on-quarter. Consolidated operating profit for the quarter hit 8.84 trillion won, representing a 10-percent increase on-quarter, while consolidated net profit for the same quarter was 7.04 trillion won. The full-year 2012 operating profit was 29.05 trillion won on revenue of 201.10 trillion won. In its earnings guidance disclosed on January 8, Samsung estimated fourth quarter consolidated revenues would reach approximately 56 trillion won with consolidated operating profit of approximately 8.8 trillion won. Highlighting the quarterly performance, Mobile Communications generated quarterly revenues of 27.23 trillion won, a 4-percent increase compared with the previous quarter. The growth was mainly driven by solid sales of Samsung’s GALAXY S IIl and GALAXY Note ll. All told, operating profit for IT & Mobile Communications, which encompasses four business units including Mobile Communications, was 5.44 trillion won on revenues of 31.32 trillion won. “Despite uncertainties in Europe and concerns over the U.S. fiscal cliff creating a difficult business environment, we did our best this quarter to achieve strong earnings based on a strategic focus on differentiated and high value-added products as well as our technological competitiveness,” said Robert Yi, Senior Vice President and Head of Investor Relations. “Heading into this year, we are expecting a slow recovery in the component business due to reduced capital expenditures, while competition in the set business will intensify further as demand slows and the mid- to low-end market expands,” he added. Mr. Yi also expressed caution over the continued strength of the Korean won in 2013. Samsung’s standout lineup of LED TVs, including premium models targeting advanced markets and TVs tailored to emerging markets, has also improved quarter-on-quarter earnings. Although demand for home appliances retreated in the December quarter due to a tepid global economy, Samsung saw increased sales of high-end refrigerators and washers in the U.S. and in European markets. On the components business side, demand for PC DRAM remained weak but growth of high value-added products such as server and mobile DRAM was constant due to increased sales of mobile devices. While the Semiconductor Business landed profits in the quarter, the Display Panel segment struggled, as demand for IT panels for notebooks and monitors remained slow. On the other hand, profitability in LCD panels for TVs and OLED panels for smartphones prevented wider losses. As for this year’s capital expenditure, the size of investment is expected to be similar to that of 2012’s.The weakening global economic recovery and looming market uncertainties are anticipated to weigh on plans for investment and performance this year, but despite global economic jitters, Samsung will respond to the market’s ebb and flow with a capex plan that is flexible in manner. The Semiconductor Business sustained profitability in the quarter, amid weak market demand, thanks to a mix of high-margin products such as servers and Solid State Drives (SSDs) coupled with differentiated 20-nanometer class NAND flash chips. A competitive edge in mobile application processors for smartphones and tablet PCs also contributed to the bottom line. Looking ahead, demand for memory chips is expected to be stifled in the first quarter, due to the seasonably weak demand for PCs and mobile devices. However, for the remainder of 2013, high value-added DRAM for mobile devices and servers will sustain profitability. Demand for logic products and NAND solutions including SSDs will remain strong throughout the year, as the industry puts greater emphasis on devices with higher capacity, greater processing power and mobility. The Display Panel Business recorded an operating profit of 1.11 trillion won on revenue of 7.75 trillion won in the fourth quarter. This represented a 5-percent decline in profits compared with the previous quarter but was up from the corresponding quarter of 2011. Despite slower-than-expected economic recovery in developed markets, panel demand in China and emerging economies remained favorable in the quarter. This was led by solid sales of TV and tablet panels which offset the slowdown in notebook and monitor panel demand. Samsung was able to secure stable growth for the quarter with an improved product mix and strengthened sales of high-end panels. Sales of LED and narrow bezel panels for premium TVs continued to grow, although the company’s TV panel sales dropped in the mid single-digit percentage range from the same period last year. However, increased sales of tablet panels as well as OLED panels for premium smartphones contributed to steady growth. Looking ahead to 2013, the company expects the market for large-size TV panels, those over 60 inches in size, to grow. Strong sales of tablet panels are also forecast to continue throughout the year. For the first quarter, however, panel demand is expected to be adversely affected by off-peak seasonality before recovering in March with new TV and tablet product launches by manufactures. The IT & Mobile Communications – comprised of Mobile Communications, Telecommunication Systems, Digital Imaging and Media Solution Center businesses – posted operating profits of 5.44 trillion won on 31.32 trillion won in revenue for the period. Out of the total IM earnings, the handset-making unit claimed 27.23 trillion won in revenue in the October-December quarter. Samsung led gains with its full lineup of entry- to mid-level smartphones, expanded sales of tablet PCs and an increase in average selling price (ASP) from the previous quarter. The success was mainly brought on by strong sales of GALAXY S III and GALAXY Note II, which beat the popularity of their predecessors with record sales in record time. In contrast, growth in network and IT-related IM businesses was stunted by heated pricing in the fourth quarter. On a brighter note, sales of Long Term Evolution (LTE) wireless broadband technology equipment continued gains while revenue from overseas sales of notebook PCs improved. The furious growth spurt seen in the global smartphone market last year is expected to be pacified by intensifying price competition compounded by a slew of new products. In the first quarter, demand for smartphones in developed countries is expected to decelerate, while their emerging counterparts will see their markets escalate with the introduction of more affordable smartphones and a bigger appetite for tablet PCs throughout the year. The Consumer Electronics Division – encompassing the Visual Display and Digital Appliances businesses – posted revenue of 13.95 trillion won for the quarter, up 20 percent quarter-on-quarter. The operating profit of 740 billion won amounted to an increase of 87 percent on the previous quarter and an increase on-year. Lifted by peak season sales, the market experienced stronger demand for TV products in both developed and emerging markets as LED TV sales drove overall market growth of over 40 percent on-quarter. Backed by favorable market conditions, Samsung outperformed the market for LED TVs with on-quarter growth of more than 50 percent. This was achieved by the company’s differentiated strategy of focusing on premium models for developed economies and region-specific models in emerging markets. Heading into 2013, sales will be led by emerging economies and the LED TV segment, which will expand its proportion of total TV sales into the mid-80 percent range. In the first quarter, the company expects off-peak seasonality to dampen on-quarter growth, although demand will be up in comparison with the previous year. For the Digital Appliances market, although global economic conditions pushed demand down on the previous quarter, Samsung was able to expand sales of premium refrigerators and washing machines as the company experienced growth in developed markets such as Europe and the U.S. Looking ahead, the company expects moderate growth in emerging markets while low growth is likely to continue in developed economies.